Combine United States History, American Literature, and Bible in a one-year high school course—Or choose to do only the history option. Earn one credit in American history, one credit in English, and one credit in Bible—If you choose to do all three components. Organized in an easy to follow manner with 30 weekly units of five lessons each. Study American history from the time of Columbus through the present. The page layout has full-color photographs and illustrations and a hardcover binding. Some changes to Unit 30 to cover events up to the date of publication. The Student Review Pack replaces the old Quiz & Exam Pack and includes literary analysis activities. Bible study is included using your family Bible choice. Exploring America is a Christian-based American history course. Exploring America is a one-year high school course that combines United States History, American Literature, and Bible. Organized in an easy to follow manner with 30 weekly units of five lessons each, you will cover American history from the time of Columbus through the present. It is feasible that you could use this course for history alone. Unit tests are separate for history, English and Bible as are the questions for the lessons, the American Voice readings, and the literature readings. I wonder why, though, because the reading choices are much more interesting than a typical American Literature course. The course is set up in a very homeschool friendly manner. The Bible lessons I checked are interesting and relevant to each unit. Three courses for the price of one is a great deal. Completing the History credit requires reading the lessons and the original documents and speeches (and answering the questions in the optional Quiz & Exam Pack if desired). Completing the English credit requires completing the weekly writing assignments and one research paper; and reading the assigned literature, poems, and short stories in American Voices. Completing the Bible credit requires reading the Bible lessons, completing the Bible assignments at the end of many lessons, and reading the hymns and other religious literature assigned. 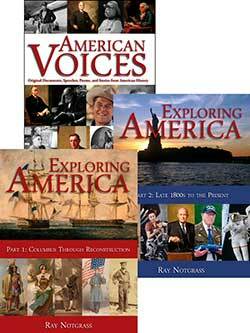 The Notgrass Exploring America Set includes one of each of the following books. Also included is a short Guide for Parents Using Exploring America. You will need additional books for the literature portion of the course. Most should be available at your public library. Alternate book choices are suggested in case some books are not easily found. NOTE: Specific page numbers are not assigned. You don’t have to use particular editions, but we do have them available for sale individually. An Exploring America Student Review Pack is also available separately below. Grades 9-12, One year course covers American History, English (American Literature and Composition), and Bible. The Student Review Book includes lesson review questions, literature review questions, and literary analysis. Read The Scarlet Letter in the first semester of Exploring America. His autobiography, the Narrative of the Life of David Crockett was written before he went to Texas and Alamo fame. Read it in the first semester of Exploring America. Learn about the life of a former slave, abolitionist, writer, editor, and orator whose speeches fired the abolitionist cause. In Narrative of the Life of Frederick Douglass, you will read about his life as a slave, his dramatic escape to the North and his eventual freedom. Read it for the first semester of Exploring America. Read Co. Aytch for the first semester of Exploring America. In His Steps is used in the second semester of Exploring America. Up From Slavery is the inspirational autobiography of the famous African-American educator Booker T. Washington. Mama’s Bank Account tells the adventures of the Mama and her immigrant Norwegian family living in San Francisco. Miracle in the Hills is the inspiring autobiography of Dr. Mary Sloop, a woman doctor, and her forty-year crusade in the mountains of North Carolina and the history of The Crossnore School which she helped to found. To Kill a Mockingbird “portrays the story of racial inequality through the eyes of a child. It contains mature themes. Read To Kill A Mockingbird the second semester of Exploring America. The Giver is an interesting book that gives a view of a “man-made” society that has its version of political correctness to help its citizens avoid conflict and anger. The book talks about euthanasia, but the main character finds out about it and opposes it. The Giver is worth reading and discussing per the Exploring America course or on your own. Read The Giver in the second semester of Exploring America.